A breathtaking little work of art! 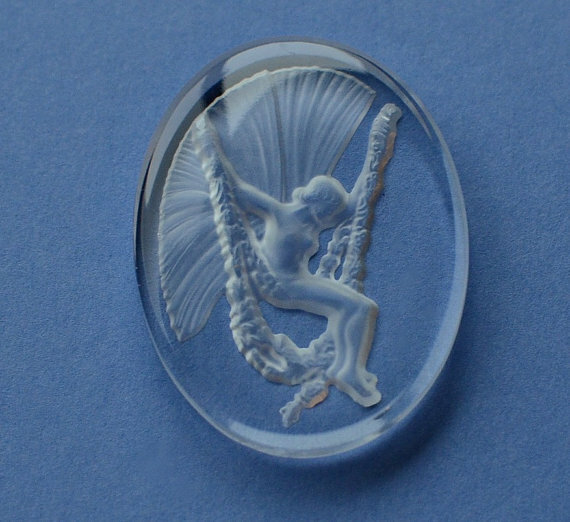 This Vintage Glass Intaglio portrays an elegant Lady Fairy or Woodland Nymph on a flower-vine swing. It reminds me of the work of artist, Alphonse Mucha. The design is "carved" from the reverse side of the piece which gives it gorgeous detail, depth, and dimension - a high-quality vintage treasure! Please Note: This lovely intaglio glass cameo is NOT a bead - it does NOT have a hole.